On a frosty day in Charleston, Illinois, Teresa Maria Linda Scholz packed her things, picked up Jack — her one eyed cat — and moved 2,200 miles away to serve as UC Santa Cruz’s new campus diversity officer for staff and students. Scholz is filling a spot that was vacant for six months, and is partnered with the chancellor and executive vice chancellor to promote an inclusive environment for students and staff. Her job requirements include initiating and developing training programs, awareness campaigns and climate surveys while maintaining the hate/bias response program. She is joining the conversation around diversity at a dynamic time politically and socially, with many underrepresented groups across campuses expressing frustration, anger and fear as the inauguration approaches. “How do we listen and how do we not minimize and undermine when people are feeling fearful of what’s going to happen in the next few weeks and the next four years,” Scholz said. Scholz previously worked at Eastern Illinois University as an associate professor of communication. She holds both master’s and bachelor’s degrees in speech communication, a master’s certification in women’s studies and a PhD in communication, with a focus and certification in diversity training. 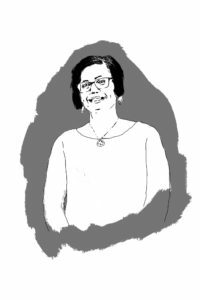 She was hired because of her “depth of experience in diversity and inclusion-related initiatives,” said Associate Chancellor Ashish Sahni in a letter to the UCSC community. But more specifically, she was hired because of her academic background in social justice and diversity, shaped by her roots in the Latinx community and feminist consciousness. Scholz said she never expected to go to college, and somewhat fumbled into it, not realizing her 3.83 GPA was far above average. Over 20 years and multiple degrees later, as a first-generation American, she views getting her PhD and achieving tenure as her proudest accomplishments. “Even though I have switched my career trajectory to administration now, my [PhD and tenure] are really important because nationwide there are very few [Latinx women] who have gotten PhDs and achieved tenure,” she said. Scholz lived in California for 10 years, moved to Antigua, Guatemala for her teens, then returned to the U.S. for college. She lived in Antigua in the mid-1980s, during the height of Guatemalan civil war conflict and human rights violations. It’s those experiences, Scholz said, that helped to shape how she views power imbalances and inequities on a global scale. “Having experienced and witnessed what it was like to live under military rule, it inspired me to learn about local, national and international power imbalances and inequities that contribute to the marginalization of non-dominant groups,” Scholz said. Through her readings of Chicanx writers such as Rigoberta Menchú, Gloria E. Anzaldúa and Cherríe Moraga, Scholz was able to better understand the politics of Guatemala at the time and “make sense of her own life” — both past and present. Though it’s been a few years since she’s returned to her home in Antigua, she makes a point of visiting her childhood church, where she lights a candle for her deceased parents. After working as an assistant nurse, Scholz began her career in education working towards solutions to issues like microaggressions in classrooms, support in student programming and fighting assumptions made about level of intelligence based on class, gender and ethnicity. Though she notes she came from humble beginnings, she acknowledges she is in a position of privilege, as an administrator, a homeowner and an educated woman. Her sights are set on starting to talk with students and staff on campus to hear direct concerns. She hopes to get out of her office often, where she inherited drab blueish walls — which she hopes to spruce up with Guatemalan rugs and a little fountain.